An audit conducted by the Department of Labor’s Office of Inspector General (OIG) concluded that OSHA needs to improve the guidance for its fatality and severe injury reporting program to better protect workers. The audit was conducted to determine whether OSHA has effectively implemented its revised fatality and severe injury reporting program, given the significant changes that the agency made to its reporting requirements in January 2015. Prior to the change, employers only had to promptly report to OSHA any work-related fatality, or hospitalization of three or more workers from a single incident. OSHA’s revised regulations require employers to report all work-related fatalities, as well as all work-related inpatient hospitalizations, amputations, and losses of an eye. Conduct inspections on all Category 1 incidents, which include incidents such as a fatality, two or more in-patient hospitalizations, injuries related to current emphasis programs, and imminent danger situations. OSHA largely disagreed with the OIG recommendations, aside from agreeing to do a better job documenting “essential” decisions, such as whether to issue a citation and when to deviate from the policy for reported incidents that should result in an onsite inspection. 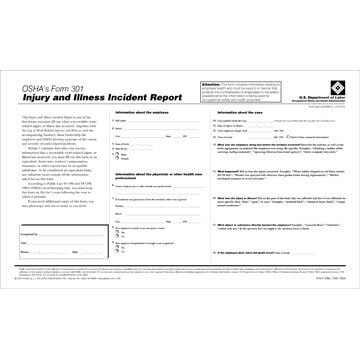 J. J. Keller's Form 301 Injury and Illness Incident Report helps you comply with OSHA's injury & illness recordkeeping requirements.